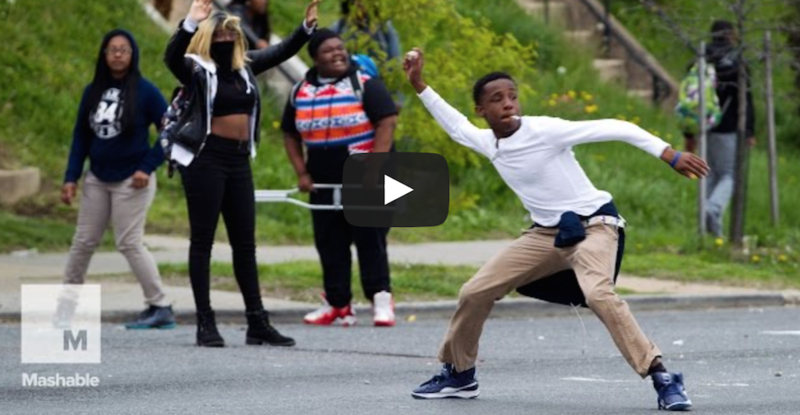 Baltimore Police Injured In Freddie Gray Death Riots As High Schoolers Call For A "Purge"
Baltimore Police Injured In Freddie Gray Death Riots As High Schoolers Call For A “Purge”. As of 10:55 PM, April 27, police are redeploying the National Guard to the city of Baltimore. Fires are popping up as quickly as they are put out, and looting of local stores continues. At least 15 officers are now reportedly injured, and two are still in the hospital. Loretta Lynch’s first official act as Attorney General will be sending DOJ officials Baltimore. A local pastor expressed anger and sorrow that black rioters destroyed a housing structure meant to provide inexpensive, affordable housing for elderly Baltimore residents. Rioters have reportedly injured five journalists. Rioters shut down Baltimore’s public schools for Tuesday. It was high schoolers that passed out fliers calling for “Anarchy” and “The Purge” who began to attack cops with bricks. Pres. Obama is asking Gov. Larry Hogan to “go easy on the violent rioters” who set fire to police cars and wrecked local businesses. We will keep you updated as the story continues. Below is a video of protesters clashing with Baltimore police. This Little Girl Is Convinced She Is Married To Her Daddy! Military Vet Finds This Hateful Note On Car And You Won’t Believe What It Says!